Looking down the hallway at all the ‘puddles’ to jump over. 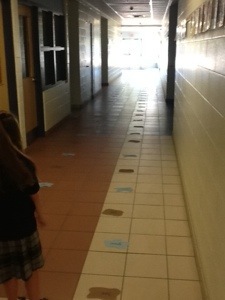 All puddles with sight words learned this year. What a joy to see the growth and learning and excitement! Looking forward to the journey that lies ahead. Posted in Early Intervention, Reading and tagged sight words. Bookmark the permalink.